As in any form of travel, some love it…some do not. The majority of people cruising today are ‘repeat cruisers’. An enormous part of the population has never cruised. 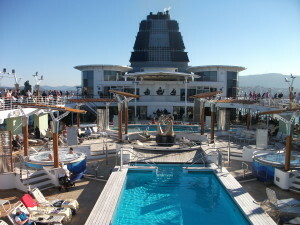 The past Royal Caribbean Cruise my husband and I cruised, more than 3/4 had never cruised before. I was very surprised! It was a ‘free cruise with a car purchase’. We upgraded to a balcony for a small cost. Most were on the cruise because it was ‘free’ and took an inside stateroom. At the end of the cruise, when asked for a show of hands at the final performances, how many plan on cruising again, most raised their hands…they were ‘hooked’! Why? It was an ‘easy form of travel’ was the primary response. No driving, food was always available, pools and hot tubs to soak up the sun on deck, shows at night, entertainment in the lounges, art shows, activities from morning until night —– All Free! Well, not all…..there are room charges for drinks, excursions, internet, spa, fitness classes and specialty dining. We are boomers. There I said it…it’s out there! Here is why many boomers enjoy cruising. Cost. Cruising is not cheap (unless you snag a great fare). But, if you were flying to all the destinations cruises visit, it could become very expensive with flights, hotels, meals, tours and transportation. When cruising from a port you have never visited before, consider arriving a few days earlier and explore the port city. Drive or fly in a couple days ahead of time. If you are retired boomers you have plenty of time! Not strenuous. Arrive at your ship port and your luggage is delivered to your room. No dragging luggage from hotel to hotel and booking flights, trains or cars to get around. No cooking. Food is available 24/7 and you don’t have to cook (or even leave your stateroom). The numerous buffets, restaurants, cafes and room service are all within a (short) walk. Well, depending on your ship, sometimes it is a longer walk, but that exercise allows for the meal dessert! Awesome, Cool. Deciding what to do onboard can be a real decision challenge. Whether you hang out on warm, reclining loungers in the spa or opt for a message, facial or other services, watch for the ‘week specials’ to spend the week or a day or so being pampered. These floating hotels are all unique in style, design and amenities. Making Friends. You will be spending your evening hours usually cruising to the next port. You can choose table seating with others which is a great way to socialize and meet others on the ship. After dinner, there are shows, casino action, shopping, lounge sing-a-longs and numerous activities. There are many opportunities to make friends, maybe even schedule a tour with others. Some cruisers while on ship plan their next cruise with their ‘new found’ friends. Lasting friendships can happen. Convenience for all. On board ship, you can find just about everything you would want on a ‘land’ vacation. There are shops, money exchanges, a medical room (if you get sick). The food consists of every type of food you can imagine. If you have a special diet, let the cruiseline know before your cruise. Indicate on your initial booking form what your needs are. Vegetarian meals and other meals are available even if not on the menu. Just ask your server. Accessibility. Most ships have ramps and elevators. If you have special needs, check the deck plans and contact the cruise line to ensure easy movement on the ship. Some smaller ships have fewer means of moving from one end of the ship to the other. Communication to home. Cruise ships use satellite internet, which can be very slow and expensive. If you leave the ship at the port destinations, there is usually Wi-Fi available at internet cafes where you can grab a coffee and check your emails or send them. The bonuses for ‘Boomers’ cruising is the determined cost of traveling to many destinations and the wide range of ships available today from small to massive. The exciting part is arriving every morning at a new destination to explore (unless it is a sea day). If you have never cruised, young or young at heart, give it a try. Like I said, some like it and some love it!